A few months ago Scott from Swish Productions and I were talking and decided to do an edit. We were a little slow off the mark as it was pretty late in the season. Pretty soon into the project we started getting the winter rains and of course snow too. Gorge Rd was too wet to ride, luckily the Wynyard Jump Park dries up pretty quick. We were also very lucky to get a chance to go down south and ride the sweet jumps on the Frew farm where the legendary Farm Jam takes place. It was late in May so well into the rainy season, but we gave it a gamble anyway. When we first got there the flat bottoms were soaked and sloppy. After un-tarping the jumps and doing hours of work digging out the slop and replacing it with dry dirt, dark clouds came over the hills and starting raining softly again. Fortunately there were moments in between where we could ride. Big thanks to the Frew brothers Brett and Dan for giving us the opportunity. We did some filming up the Skyline Bike Park after they had shut for the season. We had an invite from the crew who had been doing a lot of work on upgrades and fun new features for next season. We had the opportunity to test some of their work. They have been busy all winter with much more to come. I think next season is going to awesome. I can’t wait. Cheers boys. 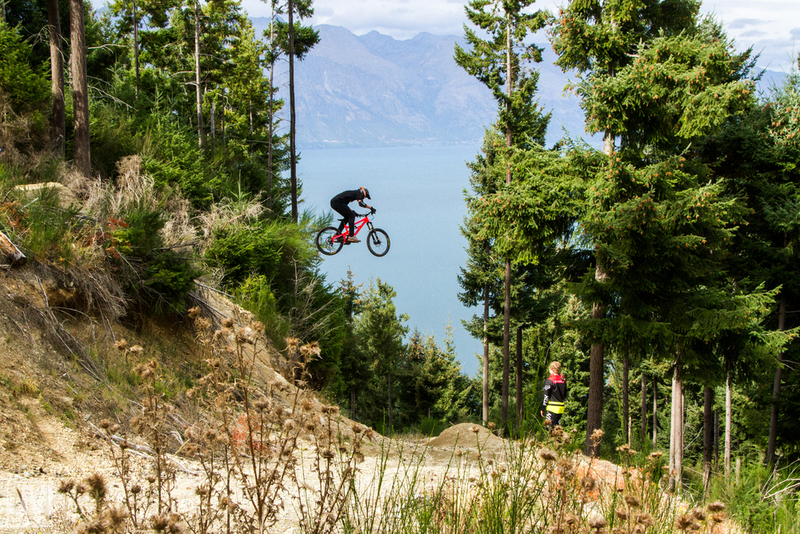 After a few cold mornings filming up Fernhill with Queenstown and the Remarkables in the background, smashing puddles of ice that had formed on the run in, we finished off on the big jumps of Dream Track. I managed to tick off a few things I hadn’t done before or for a while, so was having a great session and gaining confidence to flip the big 50 footer towards the end of the line. But it was not to be. I hit the flat jump and just didn’t start the rotation early enough. I could immediately tell it wasn’t right, so ejected midway through. Landed on my head with a concussion, broke my knee (fractures tibial plateau), badly bruised sternum and black and blue all over. To be honest I was lucky as this could have gone worse, way worse. I'm home now, recovering from surgery on the couch. It’s just that dreaded, boring weeks and weeks and weeks of patient waiting, we as riders, know all too well. I’d like this opportunity to thank all builders and everyone involved in the awesome scene we have here in Queenstown and surrounds. Thanks to everyone who has wished me a speedy recovery and been there for me during this period. Special thanks must go to my Wife Meagan who has been an amazing nurse (still working at getting her into the outfit,haha). A special thanks to the brands who support me too, Banshee Bikes, Halo Wheels, Smith Optics NZ, 3Sixty Sports, H&J Outdoor World. Please support the companies who support our sport. Last but not least cheers to Scott from Swish Productions for the edit. This guy will be a force to be reckoned with in the future, heaps of talent. Joshua Moore photography, TappedNZ Photography and Qfoto.nz for the Pics.